Oculus Announces Standalone 'Oculus Go' for $199 | OhGizmo! Back when I had a Note 4 I also bought the Gear VR, and it was one of the most amazing experiences ever. It felt amazing to be up close to whales and sharks, or to explore the cosmos with planets rotating right in front of me. I knew what I was seeing was fake, but it’s difficult to explain how almost-real it felt. Later, I moved onto iPhones and like many others, I haven’t been willing to shell out $500+ to experience VR once again, but I think that’s about to change. 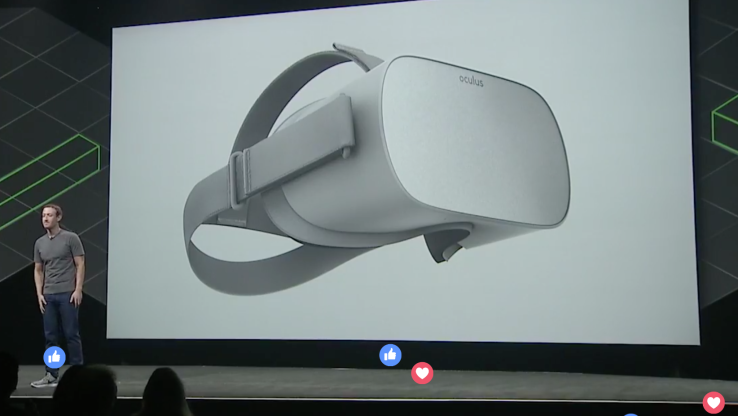 Earlier today, Oculus had their Connect presentation in San Jose and Mark Zuckerberg was on stage to announce the Oculus Go, a standalone VR headset that (finally) comes in at a reasonable $199. Its specs seem most equivalent to using a Gear VR, utilizing ‘fast-switching’ WQHD LCD screens and spatial audio, including a small controller that similar to what ships with the current Gear VR, as well as being compatible with all Gear VR software. There’s no word on battery, and there’s little in the way of specifications, such as screen resolution or refresh rate. Both of which are very important in the virtual reality experience. They will go sale sometime early next year, and I’ll definitely be buying one. And if you’ve never experienced VR, the Oculus Go looks like it’ll be a good place to start.